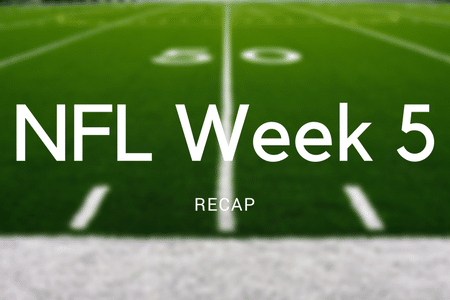 A recap of Week 5 action in the NFL on the road to the 2018 Super Bowl in Minneapolis. For Indianapolis Colts fans, Week 5 was one of the most anticipated weeks of the season, and it wasn’t because of their matchup with the 0-4 San Francisco 49ers. Former quarterback Peyton Manning returned to the city he called home for 14 seasons, where the team bestowed many honors upon the quarterback throughout the weekend. But none were bigger than the unveiling of a bronze statue, the immortalizing of Manning’s legacy right outside the stadium. In a rematch of the exciting NFC divisional matchup from the 2016 NFL Playoffs, the Green Bay Packers and Dallas Cowboys showed down in America’s Game of the Week at AT&T Stadium. And similar to past outcomes, Packers quarterback Aaron Rodgers got the final say. Despite trailing 31-28, the Packers went with an aggressive approach on their final drive, opting to go for the win instead of the tying field goal. Rodgers threw a 12-yard dime to wide receiver Davante Adams, resulting in a touchdown and giving the Packers a 35-31 lead with just 16 seconds left, and eventually, the victory. Rodgers would finish the game with 221 yards and three touchdowns on the day, a near-perfect 122.9 quarterback rating. The only remaining undefeated team in the NFL, the Kansas City Chiefs traveled to Houston to take on electric rookie quarterback Deshaun Watson and the Texans, in a game that surely did not disappoint. Despite the slew of injuries in this game (see: JJ Watt, Whitney Mercilus, Travis Kelce), the Sunday night matchup was an offensive shootout, with the Kansas City Chiefs coming out on top, 42-34. Quarterback Alex Smith, who is considered by many to be an early NFL MVP frontrunner, continued that campaign with 324 yards and three touchdowns. Watson continued to impress for the Texans, tossing FIVE touchdowns on the night.